Save for a few modernized designs, like the streamlined EarthCruiser GZLor stripped-down Go Fast, truck campers seem forever stuck in the 1970s, hulking, broad-sided monstrosities spilling off every edge of the pickups they top. 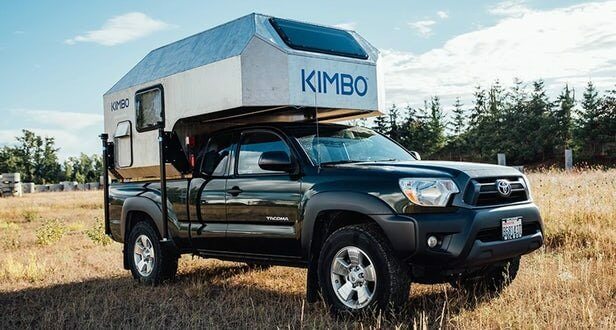 Startup venture Kimbo brings things up to date and into the future with a Tacoma-sized, riveted-aluminum mini-lodge. It’s your go-anywhere adventure rig, mobile work cubicle, flame-crackling ski lodge and tiny home away from home. Kimbo’s backstory is about as unique as the truck camper that it created. Company founder and all-around maker Mark King is better known for his work designing slim, rugged wallets, EDC multitools and accessories at Trayvax, a company he founded in 2013. Around that same time, he began traveling the world in a 19-foot (5.8-m) Airstream trailer before starting to yearn for smaller, simpler travel and living. Inspired by the space-efficient interiors of nuclear submarines, King got to work in 2016 building out the original Kimbo prototype. Over the months that followed, King and crew put over 30,000 sweat-soaked miles on several prototypes, touring their way from the incomparably deep, wet snow of the Pacific Northwest to the fiery, sun-beaten rock of the American Southwest and beyond. 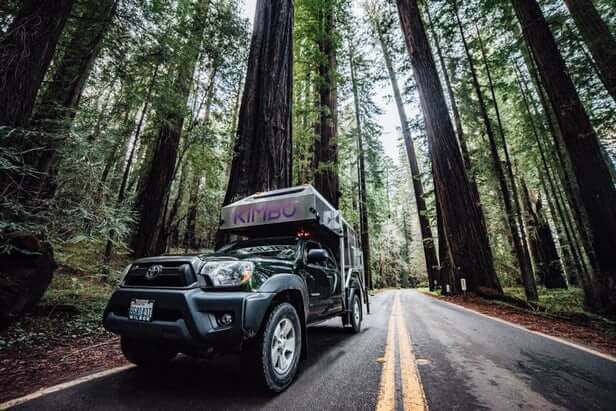 Flipping through Kimbo’s social media photos shows the camper’s evolution through multiple leg designs, door placements and organizational layouts. Eventually, the team refined everything down to a production model before rolling out its first built-to-order campers last year. 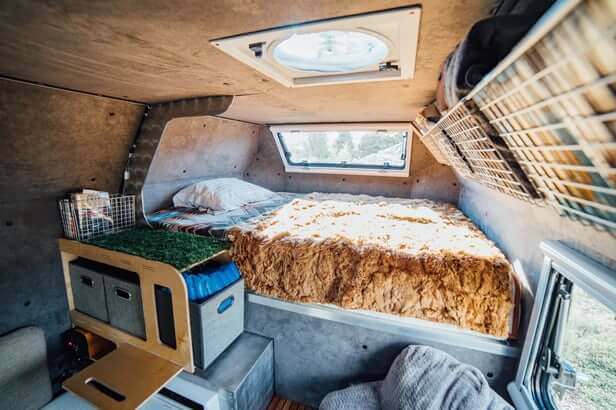 Kimbo’s camper is an alternative style of live-in pickup topper made to be lightweight, simple and nimble, while also warm, inviting and comfy. The 6 series camper tops midsize pickup trucks like the Toyota Tacoma, and its overall dimensions run 10.9 x 6.4 x 6.5 feet (3.3 x 1.95 x 2 m, L x W x H). The riveted brushed-aluminum shell features a striking frameless, faceted design that lends a powerful but artistic look while keeping base weight below 1,000 lb (454 kg). Pop the rear gull-wing door, and the cold aluminum melts away into a warm, rustic retreat, not so unlike the experience of entering the Polydrop trailer we looked at this week. We initially mistook the Kimbo camper’s interior walls for non-insulated bare aluminum, but that’s because the riveted brushed fabric mirrors the exterior’s riveted aluminum, especially since it’s intermingled with the actual aluminum of the door and interior surfaces. But the exterior shell and interior paneling are in fact separate layers that sandwich R5 insulation. Simple but seemingly quite livable, the lower floor plan combines a teak-floored entryway mudroom with a pair of small sofas. Up a level in the above-cab loft, a 54 x 75-in (137 x 191-cm) bed greets two campers at night. Standard features include a 12V battery, dimmable LED lighting, three-speed roof fan, and double-pane windows with screens and blackout shades. 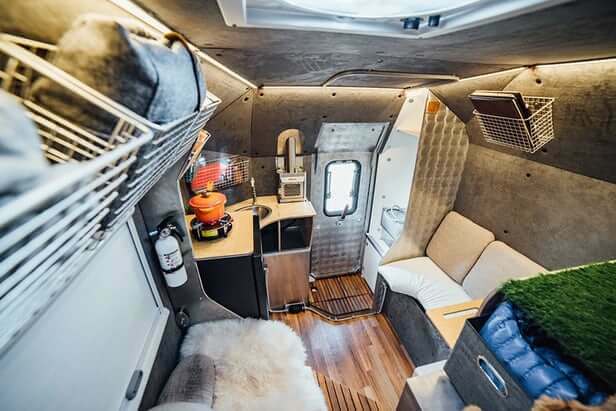 That floor plan and features package come standard in the base US$14,999 6 series camper, which has a roof-access ladder, 120V hookup, propane tank bay and solar perimeter lights outside. From there, buyers can build their living space up with add-ons like the $2,000 front-corner kitchen with sink, worktop and hot water, $1,600 small propane-fueled fireplace with hard-piped chimney, $600 desk and storage unit, or $1,300 foldaway indoor shower. A fully loaded camper with all those options plus air conditioning, roof-mounted solar charging, interior organizational bins and additional options brings the total price up to $25,999 and pushes weight to 1,100 lb (500 kg), from the 930-lb (422-kg) base weight of the $15K package. Fully equipped, the Kimbo camper roams the world as a cool, little mobile office, multi-sport base lodge and traveling hotel room, as well as a good old-fashioned truck camper. The 6 series midsize pickup camper is available now, and Kimbo builds each to order. The Bellingham, Washington-based company also plans to launch a larger 8 series model for full-size pickups later this year.